Ask fellow campers about "Lake Toho RV Resort" and nearby attractions. Very quiet, scenic area that is a bit off the beaten path. Tremendous value for the money. Lots of tame, interesting birds near the lake. A great place to relax. We're not fishermen, but it looked like a good place to fish. Saw a guy catch a bass of the dock. 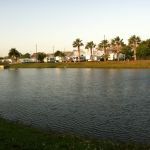 We camped at Lake Toho RV Resort in a Travel Trailer. Wild Willy's Airboat Tours are located right next to the camp office. Looked like fun, but a bit over our budget, so we didn't go. Got some beautiful sunset pictures at the lake where people were catching fish. We stayed at the campground March-May 2017. It was a very affordable option for Florida at $400 monthly. The park was very full during the season and we stayed in their newer section in the back of the park. It had recently been cleared and was all grass other than the road to the sites in back. The road was fresh asphalt and easy to maneuver our 33' Class A with tow trailer and vehicle. We had beautiful views of the sunset but the bugs were troublesome. We had to contend with major mosquitoes and an ant infestation. There were also tiny little flying insects the locals called "blind mosquitoes" which are apparently harmless but very intrusive at times. We initially rented Lot B11 but after a pretty hard rain, our entire patio area was flooded. The ladies running the office were apologetic and accommodating though. They said we could move to another site as soon as possible and we ended up choosing the site beside us B12. Those newer sites seemed to be more spacious than the sites up front (which were mostly full of snowbirds or full timers). We did have to use our satellite dish and also get a separate Internet Service Provider on our own since we couldn't stream moves or shows from the WiFi. Overall I would recommend to others and most likely stay again myself, especially once they do some more upgrading to the sites out back. 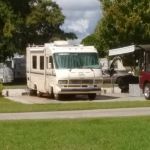 We camped at Lake Toho RV Resort in a Motorhome. Definitely check out Rodeo Diner that's about 7 miles away. Great service, food and prices! If you need to fill up propane tanks, go to Tractor Supply located in the same shopping plaza as Rodeo Diner. Came for 4, stayed for 6 nights at this tranquil, well maintained park. Most sites are long term but the residents are quiet and friendly. The gals in the office could not have been nicer! The area is beautiful, I got some gorgeous sunset photos! WiFi was okay, kind of petered out in the weekends. Bathhouse needs an update, but wasn't scary!! May go back for long term!! 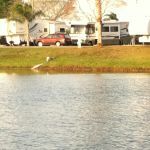 We camped at Lake Toho RV Resort in a Motorhome. Walmart in St Cloud has a horrible parking lot to get your rig through! And ZERO parking unless you block multiple spaces!! Murphy Gas Station again hard to get a rig through. This campground is mainly for snowbirds who have permanent sites. They do have a few sites available for overnight campers but the sites are at the entrance to the park. The sites are not level and we could not get our rig as level as we wanted it to be. The sites are grass with a concrete slab but no table. However, this park is on Lake Tohopekaliga and the views are gorgeous. It has a boat ramp, boat rentals and air boat rides for a fee. The overnight sites do not face the lake but they do face a pond which has two alligators to keep you company. Pets are more than welcome but keep them leashed because of the alligators. We would stay here again. We camped at Lake Toho RV Resort in a Motorhome. Walmart in St Cloud has a horrible parking lot to get your rig through! And ZERO parking unless you block multiple spaces!! Murphy Gas Station again hard to get a rig through. 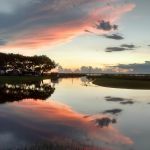 Are you affiliated with Lake Toho RV Resort ?